As Asphalt Specialists, we provide Hot Rolled Asphalt laying services which are ideal for road resurfacing. With predominantly a sand based bituminous mix with a wide range of uses from rural and National Roads to car parks and urban streets, Hot rolled asphalt makes a perfect product for producing large areas of flat ground. At Border Surfacing we provide up to 3 types of hot asphalt road laying depending on the end use of the product. Each is layered with the same care and attention but at different thickness and strengths. Sand asphalt: 0/3 used on bridge decks as a preventative measure against waterproofing damage. Hot rolled asphalt will provide a near impervious and dense stiff layer which will be resistant to compaction under traffic with a high polished stone value, resistant surface with pre-coated chippings and a durable even surface. Border Surfacing also specialise in producing professional high quality asphalt driveways for clients. 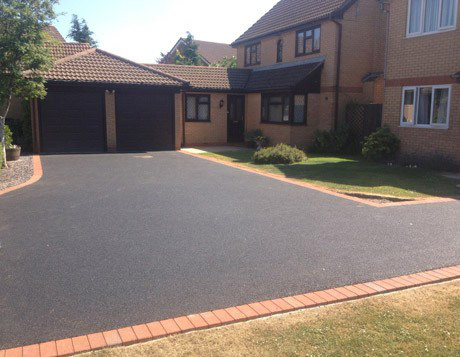 Each driveway we produce uses the best quality materials and specialist techniques to ensure a smooth and durable finish. Our highly skilled workforce ensure that each driveway is completed on time and to budget without compromising on quality which is why over 80% of our business comes from customer recommendations.